Millions of young salmon smolt pass on their rush to sea. 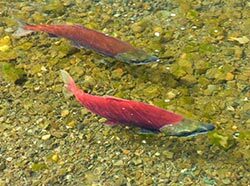 And wave upon wave of returning adult salmon enter the river in an incredible multi-species migration that lasts from spring to fall but peaks in July. The salt marsh and sedge wetland along the river draws immense flocks of waterfowl and shorebirds from April through May. More than 100 species of birds have been logged. Many of them remain to nest. Some 5,000 to 10,000 herring and mew gulls—one of the largest breeding colonies in the state—hunker down in the saturated grassland west of the harbor area to lay eggs and raise offspring. Bald eagles, merlins, and short-eared owls prey on chicks, eggs, and small animals of the marsh, while Arctic and Aleutian terns hunt the river for smolts. Harbor seals regularly periscope when the salmon are running, while beluga whales occasionally venture upriver early and late in the season. Bald eagles, harriers, and peregrine falcons patrol overhead, and coyotes can sometimes be seen snatching a quick meal among the nests. Moose browse and caribou graze along the edges. The Kenai River meanders 12 miles through marshy flats on its final drift to the sea, creating an extensive estuarine community dominated by salt-tolerant alkali grasses and sedges. Several distinct habitats converge here. Elevated spots dry out to grow alders, willow and birch with dense white spruce forest along the edges. The slow-moving water holds invertebrates and fish, and the mud banks are a storehouse of food for birds. With a tidal range of more than 15 vertical feet, the river mouth mixes fresh and salt water into a rich soup that contains 31 families of worms, small invertebrates, crustaceans and fish. This environment eases the transition that salmon must make twice in their lives: from river to ocean and back again. The mouth of the Kenai River and its rich bounty of wildlife has drawn people and their settlements for thousands of years. It remains a regional focus for fishing, commerce and recreation. Tour the different access points to find the best wildlife viewing of the day and the tide. Look for seals and whales at high tide. At low tide birds feed along the riverbanks.